LIMITED Quantities of Long and Short Sleeve Shirts will be available for purchase at packet pickup. 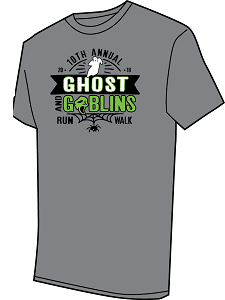 The 10th Annual Ghosts & Goblins 5K/2K, presented by the CEF, is a fundraising event to benefit the Carmel Clay schools through education grants. Founded in 1966, CEF invests in the academic excellence of the Carmel Clay Schools through grants to teachers for classroom enrichment and curriculum development. On-site registration and pre-registered packet pick-up will be available at the Carmel High School on Friday, October 26 from 4:00 to 8:00 P.M. and on Saturday, October 27 from 7:00 to 8:00 A.M. The elementary school with the most participants will be awarded the Ghosts and Goblins Trophy, which the school will have to display for one year. Sign in for your favorite school. Enter door 7 CHS Main Cafeteria (520 E Main Street) and check in at the volunteer desk. All volunteers will be sent an email reminder of your shift time. When this page loaded, the official time was 8:57:26 AM EDT.